Keeping your business plan alive is critical to the success of your business. Using your business plan as a management tool will guide your decision making and ensure that you stay focused on your goals and objectives. A living plan keeps you and your team on the same page, helps you track your progress, and sets goals for your company and your team. Here are four simple steps you can take to keep your plan alive. Fortunately, LivePlan makes this easy with the Dashboard feature. 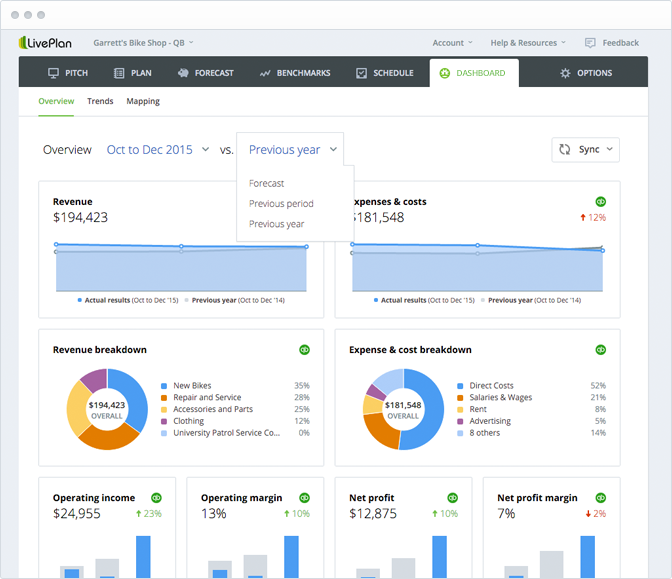 You can quickly enter your results from your accounting program for the past month or, if you use QuickBooks, LivePlan can automatically import your results. Once you have entered your actual results from last month, you can see where you are and where you need to go. Are you exceeding your sales goals? Are you on budget? To achieve the results shown in your plan, you need to make sure that important accomplishments happen on time — and adjust your planning to accommodate changes. You can use LivePlan’s Schedule feature to keep your company on track. Keep in mind that milestones can also be used for task management. For example, you can create a task, within the Milestone features, to set-up the legal structure for your business, or identify business targets, like securing 10 new clients for example. While none of us wants to add more meetings to our schedule, this is one must-have meeting that is critical to keeping your business on track and headed in the right direction. Even if you are just a small team or just a “solo-preneur,” set aside one hour every month to open up your plan and review your progress. If things aren’t going according to plan or are exceeding plan, now is the time to review what’s working and what’s not. Your plan is not set in stone, so re-adjust if you have to and set new goals for the next few months. Real business planning is not just a static document, it is a planning tool that you use to guide decision making and adjust if necessary. Don’t think of your plan as a sacred document that can’t be adjusted. Instead, adjust it regularly, reassess your assumptions and update your plan every month if necessary.